GM Gaje holds the rights to the system of Pekiti–Tirsia. 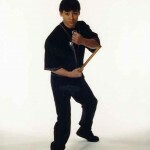 He has trained such notable instructors as Dan Inosanto. His system focuses on stick and blade fighting but his specialty is the use of the knife. The following youtube video shows Gaje & Inosanto & Tom Bisio on a New York TV broadcast in the early 1980’s.